Find.com must be accessed through the Paragon resources menu. 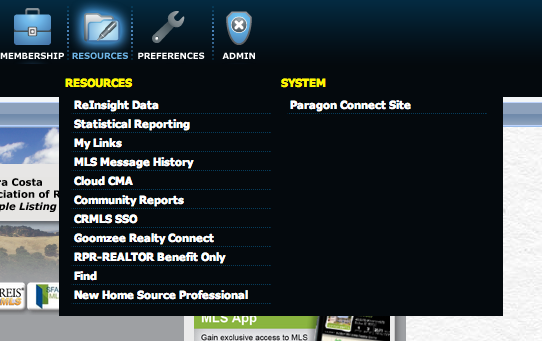 Navigate to Paragon (http://maxebrdi.paragonrels.com/) and log in. Locate and Left Click on the Resources (Folder Icon) section in the main navigation panel. Choose "Find" from the drop down list. An "Pop Up Window" will open and the main Find page will load in the new window. The default page display is the Property Search page. This is the main functional page of the database and where you will perform any search-related tasks. The Property Search contains 7 key areas. Navigation tabs – allow you to select your working area. Report Bin – displays the number of properties collected for a report. Help Link –provides access to Online Help. Search Panel – allows you to create a property search. 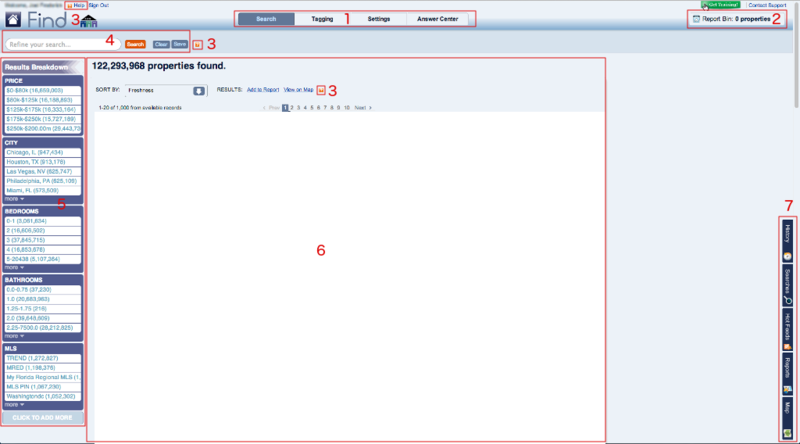 Results Breakdown Panel – displays up to 6 result categories. Search Results Panel – displays properties matching search criteria. Sidebar Tabs – provide access to saved History, saved Searches, Hot Feeds, Reports and Maps. Next Lesson: Getting Started with Text Searching.